This self-titled CD by Alice's Garden starts off promisingly with a track entitled "As I Walk," which sounds as though it could have been a left over track from Judas Priest's "Turbo Lover" CD. The vocals are high and reaching, the guitar sound drubbing, the pace fast enough to rock. No, it never reaches the tight punch of a Priest song, but the similarities are there. Sadly, the rest of "Alice's Garden" never matches the impact of its first track. Although there are some strong tracks ("Outlaw," "Drifter," "Legacy of Man"), there's also plenty of what sounds like repetitive filler ("Bad Seed, "I"). In addition, the CD sometimes sounds strangely sterile and mechanical, although that may simply be production. I'm not saying you should avoid "Alice's Garden." The CD and band have an interesting stoner / metal sound and, despite a lack of variety, your attention is held throughout. That being said, this CD could be vastly improved by simply deleting two or three tracks. Alice's Garden: Jesse James - guitars; Dave Devine - vocals, bass; Jimmy Briggs - drums. 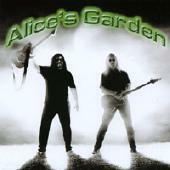 For more information, check out www.alicesgardenband.com. Revised: 09 Apr 2017 12:09:58 -0400.